Butcher Block is an expected material for cutting boards, island tops, and chopping blocks, but did you know it’s good for so much more? I have the extreme pleasure of working on our custom projects daily, and let me tell you, some of my favorites have started with a customer saying, “This idea is going to sound a little crazy, but…” But nothing! Let’s do it! Besides the amazing kitchen makeovers we’ve done, we also do quite a few non-conventional projects like bathrooms, garages, and even closets. One time I even got to help design a shuffle board table! Butcher Block makes for an extremely versatile, durable, and beautiful surface for just about any room in the house! We’ll ease our way out of the kitchen with this gorgeous handcrafted bar one of our talented customers built. He made everything by hand except the butcher block top, which is 12 feet of beautiful Maple. Kitchens are, of course, the most common projects I work on, but gaining speed in second place is the home office. You could have a beautifully warm desktop custom made to your specifications to create the perfect workspace. We can even drill the holes for cables and wires to keep your work area sleek and uncluttered. The John Boos Varnique semi-gloss finish creates the perfect surface for an office; it’s polished-looking without being glaringly shiny, holds up well to daily tasks, and cleans up like a breeze. The desktops for the office pictured below are custom Walnut Edge Grain from John Boos & Co. The shape of the top was perfectly and precisely designed to accommodate the computer station, and Boos even custom cut a piece to be used as a leg. It turned out beautifully and is still just as attractive more than two years later. We work with quite a few restaurants as well, providing work tables for the kitchen and dining tables for the guests. We have some crossover with the work tables for residential customers, but the John Boos dining tops have really gained in popularity for household use. They are beautiful, durable, and affordable, making them the perfect solution for just about anyone! While there are the traditional restaurant-style black metal bases available, most of our customers are looking to add a custom top to a preexisting base, whether it’s something they found at a flea market, or the legs from the antique dining table passed down by Grandma. These unique dining tops are available in Maple, Cherry, and Walnut. Stepping out of the living space, we find ourselves in the garage. You may be wondering what on earth a butcher block would be doing out in a garage, but this is actually quite common. We’ve done some gorgeous Walnut tops to outfit a collector’s garage, Commercial style Maple to accommodate the everyday workbench, and Industrial Maple for those who really get down to business! No matter the purpose, butcher block can add unexpected character and warmth to this often forgotten room. Here you see one customer’s (almost finished!) laundry center in their garage. The sleek Varnique finish makes for an excellent folding and sorting station! To a lesser degree, we have also outfitted bathrooms and closets. Can you imagine having a huge walk-in closet with an island for accessories right in the middle? Now picture a gleaming Cherry block atop that island…ahhh, heaven! Something like that would have never occurred to me if I hadn’t had a customer ask for just that. Add a gorgeous Roman Ogee edge, and you’ve got swank to the nth degree! One of my favorite bathroom projects was for a man who was re-figuring the room for his new wife. He had a custom Walnut top made with a curved edge (like a half moon) to expand on the vanity space so she had room for her perfumes, makeup, and hair toys without getting bogged down with “boy stuff” (his words). Because he designed and installed it himself, it was a lovely personal touch and I consider his wife a very lucky lady. The downside to all of this design fun is that I don’t always get to see the finished product. We LOVE when our customers send photos of their projects so that we can ogle and share. There’s a lot of inspiration out there, and we want to spread it around! So, if you’re planning a butcher block project, take pictures along the way and when you’re done and send them on over to us. You may even end up featured on our blog! A few years ago, when I started working for ButcherBlockCo., I had the privilege of touring the John Boos & Co. butcher block manufacturing facility in Effingham, Illinois. Seeing the process of how butcher block is made from start to finish was enlightening. It felt a lot like making furniture by hand in a workshop, but on a much larger scale. The process seems to be a wonderful balance of technology and science with craftsmanship and artistry, all working together to make these beautiful pieces of butcher block furniture come to life. Before the wood ever arrives at the manufacturing plant, individual trees are selected for harvest, encouraging forests to renew and regenerate themselves naturally. At the lumber mill, trees are cut into lumber for purchase and distribution. John Boos only buys wood from suppliers who are members of the National Hardwood Lumber Association, guaranteeing they practice responsible reforestation. When lumber arrives at the John Boos facility it is staged in their lumber yard. Lumber is sorted, piece by piece, to gauge its grade using a “grader’s stick” to approve each board for processing. After lumber is inspected and graded it “rests” in an outdoor staging area for a few weeks as part of the first steps in the drying process. Step two of the drying process is to transfer the lumber to gigantic, wood-fired kilns where it is dried for 18 to 28 days. The enormous kilns used to dry the lumber are heated by a boiler, which is fueled by sawdust and wood scraps generated during the process of making butcher block. After nearly a month of drying in the kiln, the cured lumber enters the start of the production process. All the lumber coming into the manufacturing plant is first planed and sanded to get a very flat and smooth work surface. Then it is immediately run through a glue line rip saw cutting the wood into 1.75 inch rails. Each wood rail is inspected and marked for defects using fluorescent markers, which are read by a computer to eliminate defective sections. Final rails are then sorted by grade, separating the premium rails to be used for kitchen countertops and high quality butcher block surfaces from the lower grade rails to be used for industrial countertops. All butcher block, be it blended, edge or end-grain, is then sanded down with 200 grit to provide a silky smooth cutting surface. It is then made into Boos Blocks, cutting boards, butcher block table tops, standard and custom countertops, etc. Finally, all butcher block is finished with a treatment of food-safe mineral oil or board cream before it is allowed to leave the plant. It is packaged with care and shipped to consumers, restaurants and retailers all across the US. Having seen how butcher block is made makes me appreciate all of the effort that has gone into what appears to be a relatively simple piece of wood. I know I take great pride in displaying and using my John Boos butcher block every day! Okay, let’s talk cutting boards! Having a good collection of cutting boards is something I think is essential. There is a reason there are so many different styles available – each type accomplishes a different goal. Depending on your level/style of cooking and entertaining, here is a list of some of the most commonly used and needed cutting boards. The All-purpose Chopping Block: A nice, hefty, End Grain countertop block is super handy,since it is ready when you need it, and will look beautiful in your kitchen. Not only are these blocks incredibly durable, the End Grain style is easier on your knives than other cutting surfaces, so it just makes sense to do the bulk of your chopping on one. End Grain blocks are available in a variety of sizes/woods/prices, one of which is sure to fit into your kitchen. They are also incredibly beautiful, and make a great serving surface on a buffet. The Lightweight Reversible Board: Sometimes it doesn’t make sense to use your big chopping block, and you need a board you can pull out easily and that won’t take up much storage space. Enter the reversible cutting board: a lightweight edge grain board that can be used on both sides, and easily cleaned and stowed away for next time. This is the board you are going to pull out when you just need to slice up an apple or chop some parsley or other highly pigmented food. The big chopping block is unnecessary for such a small job, and the cleanup on a smaller board is much simpler. While you don’t want to leave this board soaking, you do have the option to scrub it down well after you make all those nice green stains. Also, since this one isn’t going to be out on the counter all the time, who really cares if it has a green spot? The Carving Board: Carving boards come in a variety of sizes and styles, and the one you choose will depend on how you intend to use it and where you intend to keep it. If you are like me and only use a carving board twice a year, you can get away with a thin, relatively inexpensive, standard board with a juice groove, like this one. If you are a die-hard BBQ-er, you will benefit from a bit more heft in a board that can take a bit of a beating and is easily transported, like this board with handles and a juice groove. Now, if you’re really serious about this roasting and carving stuff, this cutting board with carving spikes and a groove tree is pretty much a no-brainer. The spikes hold the meat in place while you carve away, and the groove tree directs juices into a reservoir so you can easily whip up some gravy or au jus. If you want something that is both functional and stunningly beautiful, check out these End Grain boards with stainless steel feet; they are sure to wow at your dinner table. Serving Boards and Blocks: There are so many fun and unique serving boards available these days! From contemporary to whimsical, and everything in between, we’ve got you covered no matter the occasion! Whether you are hosting an elegant dinner party or a potluck lunch, wooden serving boards will bring warmth and function to your table. With the holidays quickly approaching, now is a great time to add some interesting cutting boards to your collection. They make great gifts, too! The Mini-Boos Block and cheese hatchet set is a perfect housewarming or hostess gift and looks fantastic on any table. Butcher Block Countertops – How to choose the right one for your kitchen. Perhaps this summer you’re considering a kitchen remodel and upgrading your kitchen countertops or island top. There are a number of different countertop materials to choose from, each with its own unique benefit. Butcher block countertops are timeless, having been around for generations and remaining extremely popular today. Many people migrate to the natural wood grain of butcher block because it fits any kitchen décor style, be it traditional, contemporary, or eclectic. Butcher block is often chosen for kitchen island tops because of its durability and versatility, doubling as both a chopping surface and serving table. 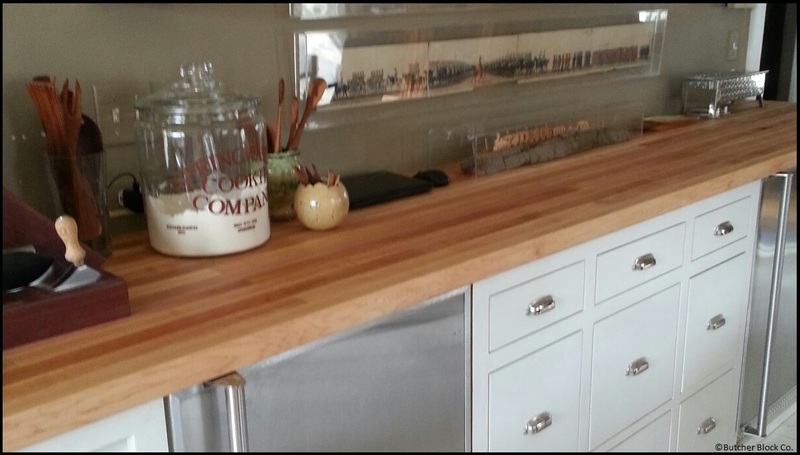 Choosing butcher block countertops can be daunting and involves a significant investment. But here are some considerations to help make the process easy! Perfect butcher block countertops fit your kitchen décor, your space, and your budget. Think about how light/dark and cool/warm you want your kitchen to look. Hard Rock Maple is very light in color and uniform in appearance. It can help brighten a kitchen and make it feel light, airy and cool. Red Oak is of medium tone, with a golden, red tint. It falls in the middle of the wood species selection with regard to light/dark or warm/cool. American Cherry has a warm, red tint and can add both color and warmth to a kitchen. Black Walnut is naturally a chocolate brown color, and can help darken a kitchen or visually warm a kitchen with its rich tone. You can match, or you can complement other wood grain in your kitchen. Matching the color of an existing wood can be difficult since many woods darken with age. But matching a species and a grain pattern is much easier. If you have Maple cabinets now, you can consider Maple countertops as a nice match. Often it is more interesting to mix and match woods. Differences in textures and colors, in moderation, can work nicely together. It is easy to complement woods, especially when they are separated, like a wood floor and wood countertop. Or kitchen cabinets and counter tops separated by a tile backsplash. Just be mindful; make it look well thought-out, not like an add-on. Three grain-style choices for butcher block countertops: Blended Grain, Edge Grain and End Grain. Blended Grain will give a wide variety of color and grain pattern. Rails of varying lengths are finger-jointed together showing much visual texture. Blended grain can look “busy” so it is awesome when paired with a simple kitchen design, regardless of your decorating style. It is the most affordable grain style. Edge Grain is the end result when full-length rails are bonded side by side giving the appearance of a solid tabletop. There is some color and grain variation, therefore it is well suited for matching with other woods or natural stone surfaces in your kitchen. Edge grain is moderately priced. End Grain countertops provide lots of color and texture variation within the checkerboard pattern. It has a very upscale appearance and is pricier, but it is the traditional butcher block look that shouts professional gourmet chef! 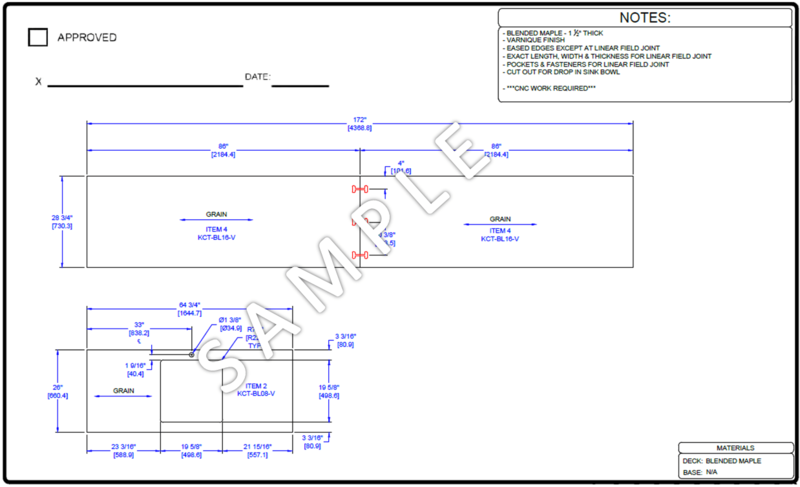 Your final considerations are a bit easier and they include your DIMENSIONS and FINISHING TOUCHES. Choose your butcher block countertops now!